Chemistry graduate David Evans has been formally recognised as Global Winner of the Chemical and Pharmaceutical Sciences category at the 2016 Undergraduate Awards (UA), often referred to as a ‘junior Nobel Prize’. 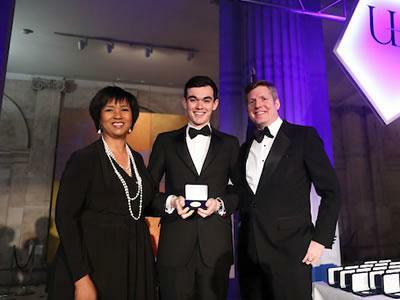 David travelled to Dublin for the UA Global Summit of the world’s top 150 undergraduate students, where he received his award from NASA Astronaut, Dr Mae Jemison, and Chair of the Undergraduate Awards, Jim Barry. David was honoured for his contribution to pioneering work on the discovery of an effective new chemical pathway, with the potential to eventually aid research into new drugs. David graduated in summer 2016 with a Master of Chemistry degree with first class honours. His award-winning research was carried out during a six month placement at the ENSICAEN research facility in Normandy, France, during the first half of his fourth year and was written up for his final year dissertation. David’s research, with Tharwat Mohy El Dine, Jérôme Blanchet and Jacques Rouden in Caen, has been published in Chemistry: A European Journal.